TriMet’s next MAX project will improve the rail crossing at the intersection of E 139th Avenue and E Burnside Street. The work will require disrupting the MAX Blue Line between the E 122nd Ave Station and the E 148th Ave Station Saturday, Dec. 1 through Sunday, Dec. 2. Crews will also replace the rail ties, repair the track bed and improve the roadway next to the rails. The project will increase the reliability of MAX service and improve riders’ overall experience. It also creates a smoother crossing for autos, bicycles and pedestrians. This project will have much less impact on service than our Hillsboro MAX Improvements did in October – two days rather than two weeks. While the MAX Blue Line is disrupted during the Dec. 1 weekend, shuttle buses will serve stations between the E 122nd Ave Station and the E 148th Ave Station. Plan an extra 10-15 minutes for transferring between trains and shuttle buses. Be sure to check trimet.org/alerts before traveling. Trains will resume regular service through the area at the start of service Monday morning, Dec. 3. Customer service representatives will be at both stations to help from 10 a.m. to 10:30 p.m. during the disruption. You can also reach out to our Rider Support team 24 hours a day via text message at 503-238-7433 and on twitter at @trimethelp, or call 503-238-RIDE (7433) seven days a week between 7:30 a.m. and 5:30 p.m.
Northbound and southbound lanes on E 139th Avenue over the MAX tracks will be closed, with only right turns permitted onto E Burnside. Eastbound and westbound lanes on E Burnside will remain open, with intermittent flagging for heavy equipment. We thank riders and motorists in advance for your patience while we complete this important work. 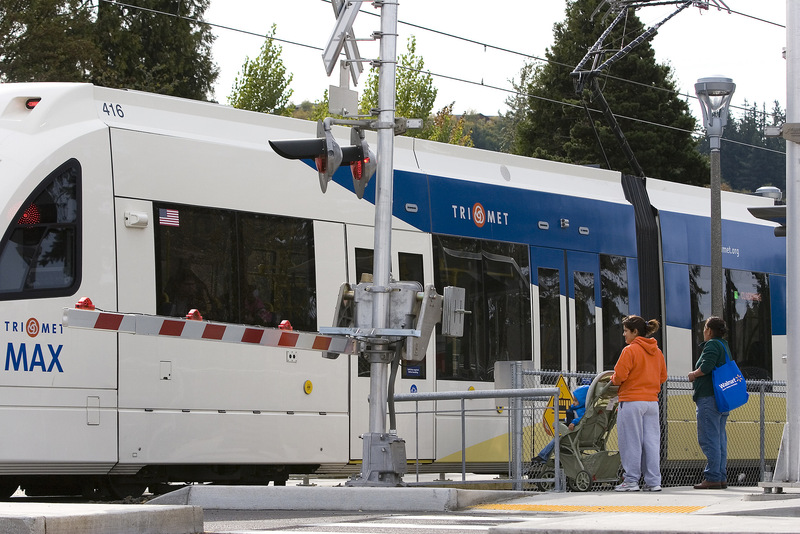 TriMet’s MAX Blue Line is the oldest and longest light rail line in our system. It opened for service between Gresham and Downtown Portland in 1986. Today, it connects Gresham, Portland, Beaverton and Hillsboro, with 51 stations on nearly 33 miles of track. The MAX Blue Line carried an average of 55,360 riders on weekdays in May 2018. TriMet is committed to making transit better. We are working to improve the overall rider experience. 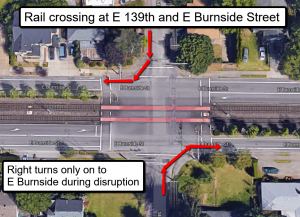 Ongoing upgrades to vehicles, stations and tracks like those at the E 139th Avenue crossing are helping to improve reliability and make the ride more comfortable. We’re also adding more service on existing bus lines for less waiting at stops and less crowding on board, and adding new service for connections to jobs, school and other community services.